Invented by Jim Kendrick, the Kendrick Dew Control System is the most flexible, highest quality dew control system available. 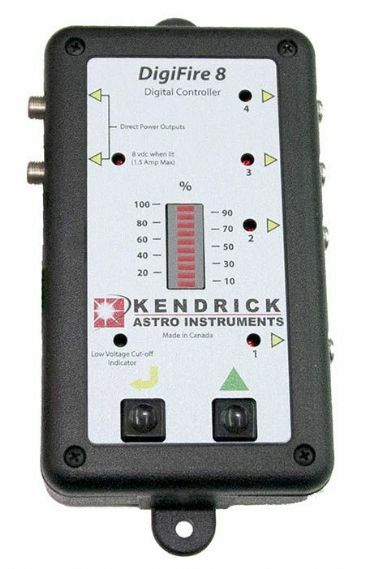 The Kendrick Dew Controller, supplies power to your Kendrick dew heater. Dew controllers are available in the standard dual-channel version, and the more advanced Digifire range, which are more powerful, programmable and have 4 or more power channels. Dew heaters consist of a strip or band, which wraps around the front of the telescope, and plugs into the dew controller, gently warming your telescope optics to keep them free of condensation, which forms very quickly at night. Kendrick FireFly dew heaters are economically priced, and powerful enough to cope with most dew conditions. 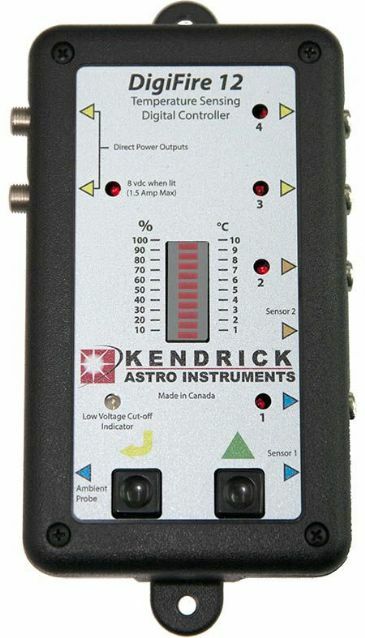 The Kendrick Premium Dew Heater range is the highest quality available and is tougher, more powerful, and more flexible – best for very dewy conditions common in the northern Europe and the UK, and all night CCD imaging sessions with larger telescopes. Kendrick Dew Shields are very high quality double stitched with a flocked interior. They slow down dew and are considered essential for astro-imaging, improving contrast and blocking out ground based light. The Kendrick Standard Dew Shield can be used with Kendrick dew heaters for the ultimate in dew protection. The ZapCap dewshields have built in dew heaters and connects to any Kendrick dew controller. In order to make an educated decision, we recommend reading the Kendrick vs Competitor Comparison and Dew Heaters - Frequently Asked Questions. The Digifire 12 has all the Digifire 8 features, plus temperature control via sensors! The new DigiFire 8 has all the features of the former DigiFire 7, plus some improvements.